Tilapia are not native to California, but are widely used in aquaculture farming. Different Tilapia species have been introduced into the wild, where they have interbred to produce hybrids. Below we describe the different species and their life histories. Hybrids would be expected to show some combination of the identification features and life histories. Mozambique tilapia hybrid, male, observed in the Salton Sea on 10/05/06. Photo by Sharon Keeney, California Department of Fish and Game. Note: this is a California Mozambique tilapia hybrid (Oreochromis mossambicus x O. urolepis hornorum). 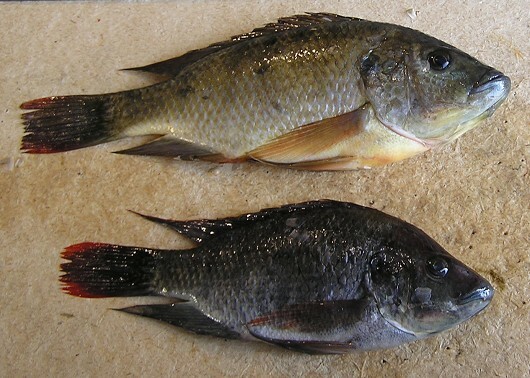 Mozambique tilapia hybrid, female (top) and male (bottom), captured from the Salton Sea in 2006. Photo by Sharon Keeney, California Department of Fish and Game. Note: these are tilapia hybrids (O. mossambicus x O. urolepis hornorum). Redbelly tilapia, spawning colors. Location: Arthur 0.5 Drain, Salton Sea. Date: Oct. 28, 2010. Photo by Sharon Keeney, California Department of Fish and Game. 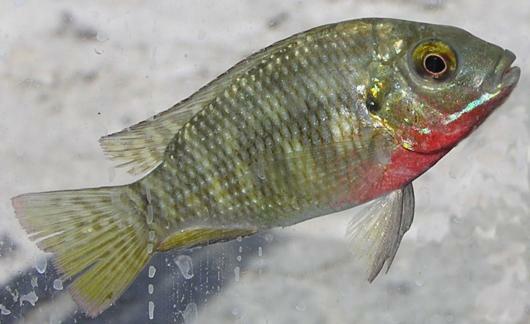 Redbelly tilapia, non-spawning colors. Location: Arthur 0.5 Drain, Salton Sea. Date: Oct. 28, 2010. Photo by Sharon Keeney, California Department of Fish and Game. Redbelly tilapia, spawning colors (left side). Location: Arthur 0.5 Drain, Salton Sea. Date: Oct. 28, 2010. Photo by Sharon Keeney, California Department of Fish and Game. Redbelly tilapia, non-spawning colors (left side). Location: Oasis-Grant Drain, Salton Sea. Date: Oct. 25, 2010. Photo by Sharon Keeney, California Department of Fish and Game. Blue Tilapia can adapt to various habitats but are most commonly found in sloughs, backwaters, canals, and reservoirs. They are mostly a freshwater fish but can survive in salinities 2-3 times higher than that of sea water. They can also survive in water as cold as 5°C, lower than most other Tilapia species can withstand. In California they feed primarily on aquatic plants and filamentous algae but in their native range they will also filter feed for zooplankton. Juveniles will prey on individual zooplankton until filtering becomes more energetically efficient. Sexual maturity for both sexes is reached when they have grown to between 10 cm and 18 cm, usually within their first year. Spawning occurs when a male claims a territory and digs a shallow pit for a nest. He then displays in front of the female school, convincing a female to follow him back to the nest. The pair will swim in circles before the female deposits her eggs onto the nest and then takes them into her mouth. The male responds by releasing his milt which the female in turn, takes into her mouth to fertilize the eggs. Once this fertilization is complete, the male chases that female away and begins displaying for another. The female incubates the eggs in her mouth until the young are free swimming and capable of being released into the water. The young stay with their mother for a few days after release during which time they can retreat to the safety of her mouth when a predator approaches. At the end of this period the young form massive schools in shallow water while the female returns to the school of females and may spawn again. Breeding can be repeated every 33-59 days. In their native lakes Blue Tilapia can grow to be 8-16 cm in their first year and 16-27 cm in their second reaching a maximum length of 37 cm and weight of 1 kg. Mozambique Tilapia are commonly found in warm weedy ponds, canals, and river backwaters. A somewhat unique population is found in the Salton Sea where they are most common along the shore and in estuaries. They can survive in temperatures as low as 5.5°C for short periods but below 15°C they become sluggish and are easily infected by fungus and parasites. A couple of days in these conditions is almost always lethal. Anything above 37°C is usually also lethal making the optimum temperature for growth between 25°C and 30°C. Mozambique Ttilapia can also survive in salinities as high as 120 ppt and even reproduce in salinities as high as 69 ppt. Males are usually found in soft bottomed areas ideal for nest construction while females and young stay in areas with harder bottoms and more food. This food is usually made up of planktonic algae, aquatic plants, detritus, invertebrates, and even other fish if they are available. Zooplankton are especially important to juveniles. While Mozambique Tilapia have often been used as a method of weed control it is believed that this omnivorous diet and the large size of male territories limits the Mozambique Tilapia from being useful in this regard. Mozambique Tilapia mature at 6-14 cm in length and can breed continuously in temperatures over 20°C. Spawning occurs when a male claims a territory 15-140 cm in diameter and digs a shallow pit for a nest. He then displays in front of the female school convincing a female to follow him back to the nest. The pair will swim in circles before the female first deposits 100-600 eggs onto the nest and then takes them into her mouth. The male responds by releasing his milt which the female also takes into her mouth to fertilize the eggs. Once this process is complete the male chases that female away and begins displaying for another. The female incubates the eggs in her mouth for 11-12 days at which point she ejects her already free swimming offspring into the water. The young stay with their mother for 4-8 days during which time they can retreat to the safety of her mouth when a predator approaches. At the end of this period the young form massive schools in shallow water while the female returns to the adult school to find another mate. She can spawn again in 10-30 days. The young can grow as fast as 25-61 mm per month in ideal experimental situations but in more natural settings they usually reach 16-18 cm in 3-5 years. The largest individual recorded in California was 38 cm in length. No definitive information is currently available for wild Nile Tilapia in California. It is a common species for aquaculture farming where they are likely to have escaped from into the Colorado River. They can survive temperatures as high as 39-40°C but are less tolerant of high salinities than other Tilapia. Fry will start on a diet of zooplankton and small insects but will become almost completely herbivorous when the reach 5-6 cm. As they get larger their diet will focus on phytoplankton like cyanobacteria but will also include bacteria, aquatic plants, and the small invertebrates that can be found on such plants. Nile Tilapia reach maturity when they are 18-30 cm in length and breeding begins when temperatures pass 18-19°C. Spawning occurs when males claim a territory and dig a shallow pit for a nest. He then displays in front of the female school convincing a female to follow him back to the nest. The pair will swim in circles before the female first deposits her eggs onto the nest and then takes them into her mouth. The male responds by releasing his milt which the female also takes into her mouth to fertilize the eggs. Once complete the male chases that female away and begins displaying for another. The female incubates the eggs in her mouth until they hatch and keeps the young there until they are free swimming and capable of being released into the water. The young stay with their mother for a few days after release during which time they can retreat to the safety of her mouth when a predator approaches. At the end of this period the young form massive schools in shallow water while the female returns to the adult school to find another mate. Nile Tilapia are known to reach lengths of 40-65 cm and weights of 4-7 kg. Redbelly Tilapia are naturally found in large lakes and rivers but have successfully invaded a variety of ponds, irrigation ditches, and other artificial habitats. In California this is especially true in the warm, saline, irrigation return waters of the Imperial Valley. They have been found in salinities of 29-35 ppt and temperatures as high as 38°C. Low temperatures seem to be a restraint however as temperatures below 13°C are usually lethal and reproduction can not happen below 20°C. Aquatic plants and algae make up the majority of their diet and their teeth are designed for optimum foraging of these materials. Despite this adaptation Tilapia will still eat invertebrates, often when found on aquatic vegetation, and even fish provided they are dead or dying. The young also feed substantially on crustaceans for the first few months of life. Mating begins whenever waters are above 20°C, which in Southern California is about 6 months of the year. 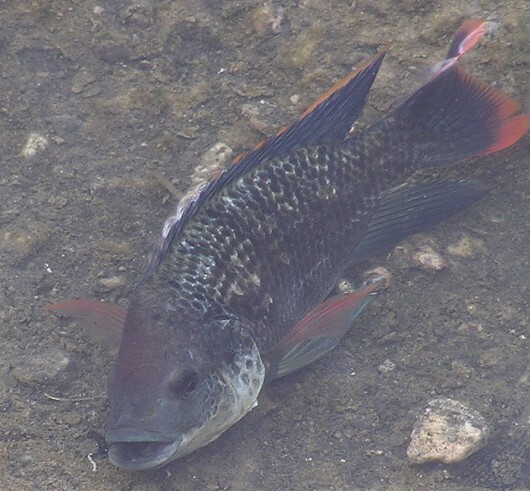 Redbelly Tilapia will look for shallow, protected areas with bottoms of rock, sand, or mud, but prefer a softer substrate to dig their nests into. They breed in circular colonies with the outer fish providing a line of protection for those inside of the circle. Spawning occurs when a mating pair is formed and a nest is built into the substrate. The female will then lay her 1,000-6,000 eggs inside the nest for the male to fertilize. Both parents will care for the embryos by fanning water across the eggs to increase oxygen intake, removing debris from the nest, and blocking the entrance with their bodies as protection from predators. The embryos hatch in 2-3 days and the young are then transferred by mouth or fin fanning to a nearby depression for 3-4 days until their yolk sac is absorbed and they become free swimming. Adults can mate again in a month and can continue to do so as long as conditions are acceptable. In California this usually means between 4 and 6 broods a season. Growth for young Tilapia is very dependent on the size of their population. In low densities like those found in irrigation ditches they can grow as much as 17 cm in first year but tilapia found in crowded ponds can take as long as 2 years to reach a length of only 7 cm. 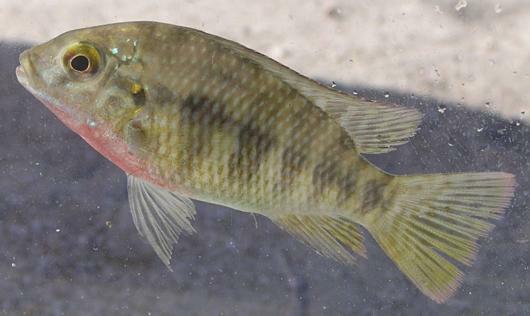 Redbelly Tilapia normally measure 13-14 cm TL before breeding, but may mature at smaller sizes in Imperial Valley ditches and Coachella Valley ditches.